This is the final one of a series of Restart Parties in supported by the London Waste and Recycling Board. We are delighted to be on home turf for this one, in partnership with Southwark Council and at Restart HQ. This is a free event where you can bring along your slow laptops, broken printers, smartphones, coffee grinders, lamps, kettles – you name it. We will have a go at fixing most anything with a plug or battery and which can be carried – we don’t do white goods like fridges because of the size, or microwaves (because of safety issues). There is no need to book in advance (if you want to, please do so on our Meetup Page) but please arrive at least 30 minutes before the end of the event (3pm) or ideally as early as possible in case demand is high. The aim of the event is to promote the repair and maintenance of electronic products that may otherwise be needlessly thrown away. This is not a training course but we will give you some useful tips and knowledge regarding your gadgets and hopefully save you some money! Attending means that you take responsibility for your own gadget, your own data, so please do not forget to back-up your data. And bring all relevant cables and leads. The event starts at 12pm until 3pm. Once again we are making a special tour of London in autumn 2017, visiting new boroughs and fixing alongside residents, sponsored by Recycle for London. Join us on our virtual tour bus round 9 London boroughs. You can see the impact we made on last year's tour below - in gadgets fixed and carbon saved. Join us at an event to get something fixed or to volunteer, and help make this year's tour as good as the last. 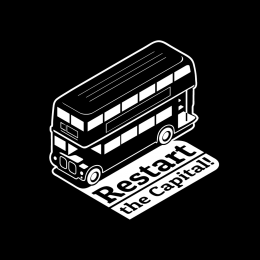 Our official hashtag is #RestartLDN - please share your photos and feedback!